Paint on a roll. No More painting or spraying exterior building facades or window frames. Our premium quality Exterior Vinyl Finishes will to transform your buildings cladding, windows, doors and panels. Enhancing a building exterior by renovating its windows and facade. We can give you building exterior a fast yet simple cost effective makeover using exterior vinyls. Save time and your money if we compare vinyl to traditional methods, if using expensive repainting or remodelling of a building. We can enhance your buildings appearance with our durable, cost-effective hard-wearing exterior vinyl finishes. With strong adhesives our exterior vinyls can be applied in most weather conditions including Winter. With no odours or down time compared to traditional painting methods. 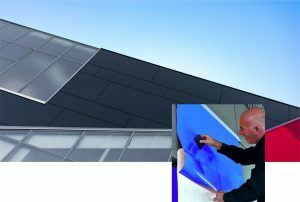 We require no masking, plus our exterior vinyl’s require no drying time. Unlike paint, applying our exterior vinyl’s will not need multiple applications or leave over-spray on nearby vehicles and neighbour properties. Our external vinyls come with a 10 year warranty.